This blog outlines our experience moving one of our projects to Continuous delivery Model using GoCD on AWS. Prior to this implementation our code deployments were manual and on demand. We were looking for automated way of deploying code to various environments with minimal manual intervention. 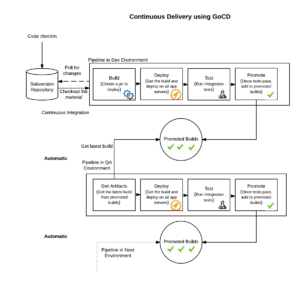 GoCD has continuous delivery as a first-class concept and provides an intuitive interface to start building CD pipelines. We started off with a quick PoC to validate some of our understanding and after initial success, we now use GoCD to define all of our deployment/delivery pipelines. This move forced us to have comprehensive test suite and work flow defined to set the criteria to promote code in different environments. The change also increased our ability to push more but smaller changes frequently. It is fairly often to see the terms Continuous Delivery and Continuous Deployment used interchangeably. For some this is a huge distinction and for some this does not matter. Continuous Deployment provides the ability to automatically release the new features and changes to production quickly as the code is checked-in. This typically means there are no process related gating functions between code being checked in and a release of that software making it to production. The only(simplification) gating function is whether or not the automated test suite has passed. Any code defect will lead to test failures and will force the deployment to fail and stop, so it is important to write integration tests with maximum scenario coverage in order to proceed towards continuous deployment. Continuous Delivery, while similar to Continuous Deployment differs in one major aspect – that automation goes as far as the process within an organization allows – and then relies on human or other approval processes to then deploy to production. Continuous integration and continuous delivery are a prerequisite for continuous deployment. GoCD is a tool which provides us the ability to create pipelines to accomplish continuous delivery. Now that we have that squared away, let’s look at GoCD and how we can use it in a bit more depth. Each artifact (service) being deployed to various environments in the form of pipelines can form a pipeline group. A pipeline within a pipeline group will deploy the artifact to an environment (like DEV or QA). A pipeline consists of various stages; each stage consists of jobs which execute in parallel and lastly, each job consists of tasks which execute sequentially. Pipelines can be shared among multiple artifact pipelines using a “pipeline template”. For example, QA pipelines of 2 different applications – ServiceA and ServiceB can share same pipeline template. Environment variables and other properties can be shared between pipelines belonging to same environment in form of GoCD “environments“. For instance, environment variables created in GoCD DEV environment are available to all GoCD DEV pipelines. Go-Server and Go-Agent are entities which together provide us the ability to form and run pipelines. Go-server allows us to create pipelines, maintain configurations and any addition data which composes our pipelines. Go-Agents take command from Go-Server and execute the stages of pipeline. Below diagram depicts the sample workflow created using GoCD tool. Source control system used is subversion and the deployment is on AWS, but other deployments are similar and instructions can be found https://gocd.io website. This workflow shows deployment through 2 environments : Dev and QA. Once the code gets checked-in, it is picked up by the Build stage of DEV pipeline, which is polling for the changes on trunk. Four stages are set up for pipeline on each environment. In DEV follow the order of build, deployment, integration testing and build promotion for next environment. For QA environment, artifact promoted in DEV is used as the material (input to pipeline). If you want to have separate agents addressing different environments, check the agent you want to modify, click environments and make changes. Create a new pipeline group, then add pipeline within this pipeline group. Add material information, for DEV pipeline, it should be one or more svn (or other version controlled) artifact. For consecutive pipelines, it should be a pipeline stage from parent pipeline. Within stages, add jobs and then add tasks within each job. 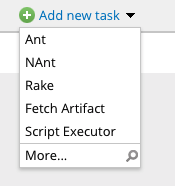 Task can be one of the primary task types from dropdown list, or execute shell scripts using the “Script Executor” plugin. From the home page, click environments and add a new Pipeline Environment if none exists using “Add A New Environment“. Make sure Pipeline Environment has an agent associated with it in order for any pipeline within it to run. Agents can be added via ‘Add Agents’ tab when you create environment or can be managed using ‘Agents’ tab, as shown above. Environment can have all the environment variables which are shared by pipelines within it. Also, pipeline can have its own environment variables. New pipeline is by default in paused state. Once pipeline is created, go to pipelines tab, and click ‘pause’ button to un-pause the pipeline. 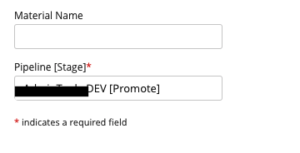 If the pipelines are to be reused, go to admin/pipelines page and click ‘Extract Template’ for the template to extract. 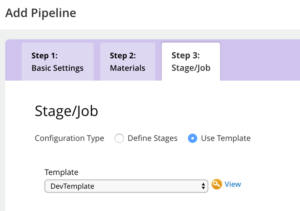 To use extracted template, instead of creating stages, click “Use Template” when you create a new pipeline. Script executor plugin used above can be downloaded from here. There are lots of other plugins too provided by GoCD. To install above plugin, download only jar from releases and place it here: <go-server-location>/plugins/external & restart Go Server. Listed below are the default locations. There are multiple mechanisms to setup authentication with GoCD. We used File based authentication. The user is prompted for the password. The password will be encrypted using the modified Apache MD5 algorithm. If the file does not exist, htpasswd will do nothing except return an error. -s to force htpasswd to use SHA1. Go to Admin page, and click on Server Configuration tab. Under User Management section, find the ‘Password File Settings’ and mention the path /users/go/.passwd, then click Save. Deleting pipelines folder from /var/lib/go-agent. It is temporary working directory to maintain pipelines data by go-agent. Moving go-server pipeline artifacts config to new location with higher disk space (like a different mount location). Update ‘artifactsDir’ in Admin→Config XML to this location. Do trunk based deployments, and promote same binaries across all environments. When starting a new service or project, develop on the dev branch or feature branch for the group. Merge with trunk when ready, but use trunk when doing any new deployments after that. Merge your branch to trunk frequently, with set of thorough tests. Update the dev branch often with trunk during development. This ensures less time merging with master. Add Tests (unit, integration, smoke, regression, etc. ), without tests CD will always put us on risk of promoting builds with bugs. Use manual pipelines/interference only on rare scenarios. Embrace CD as often as possible. I disagree with the definitions of continuous deployment and continuous delivery. I would say that in continuous deployment, you have the ability to automatically deploy new code to production, but this may not be available for the users, for instance, in case you use techniques such as feature toggle, where you can turn features on or off. But continuous delivery is really about delivering new features to the end users, and it does not necessarily needs manual process, even though in most cases this is what happens.